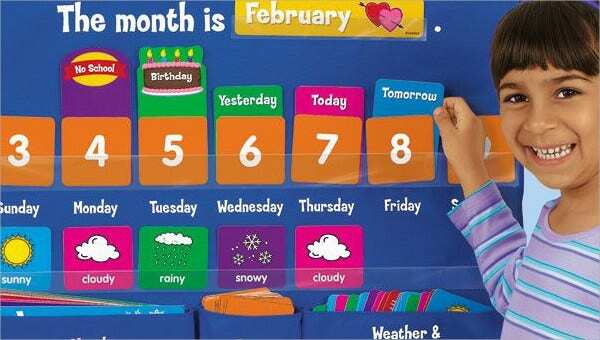 A preschool calendar is used to guide preschoolers in their daily activities. 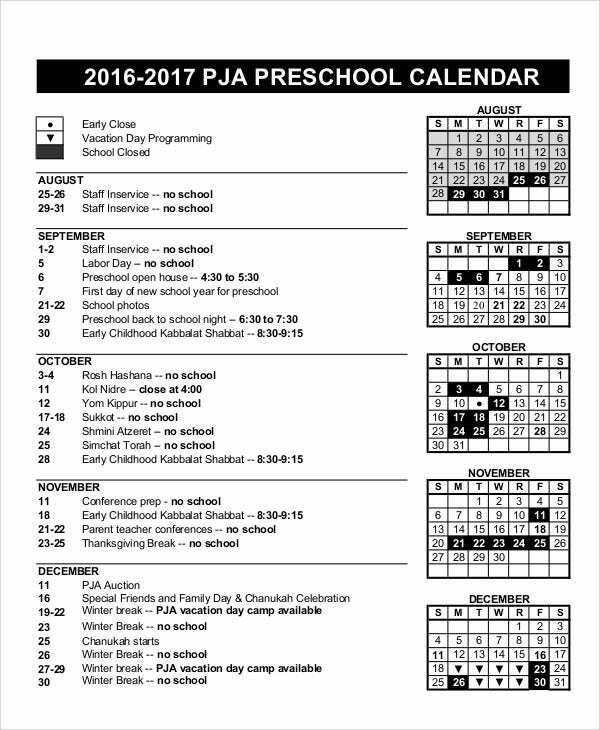 There are preschool calendars in the form of a Monthly Calendar should they be used in the monthly academic scheduling. A preschool calendar can make toddlers aware of the routine they need to follow, making it easier for them to adjust to varying situations. 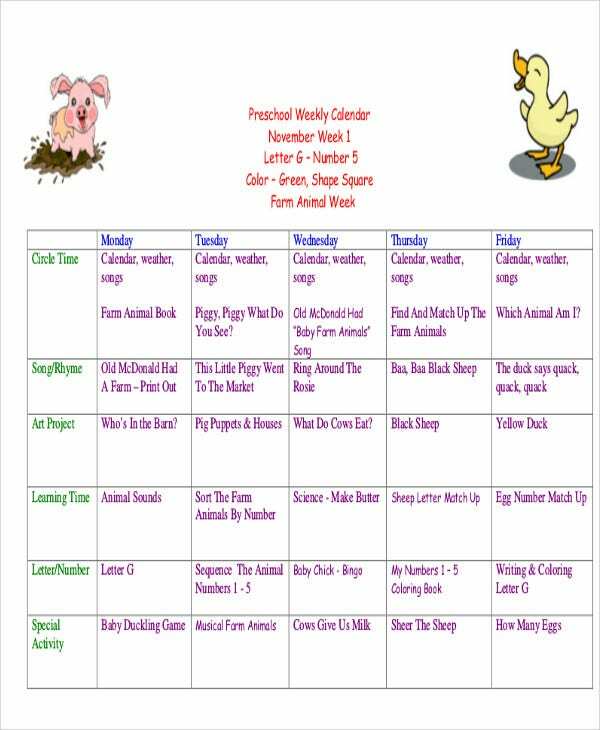 If you want to create a preschool calendar, you may refer to our preschool calendar templates. We have different kinds of templates that are applicable for various situations as well as for various needs. Other than that, we can also provide you with samples of Perpetual Calendar templates in the link provided. 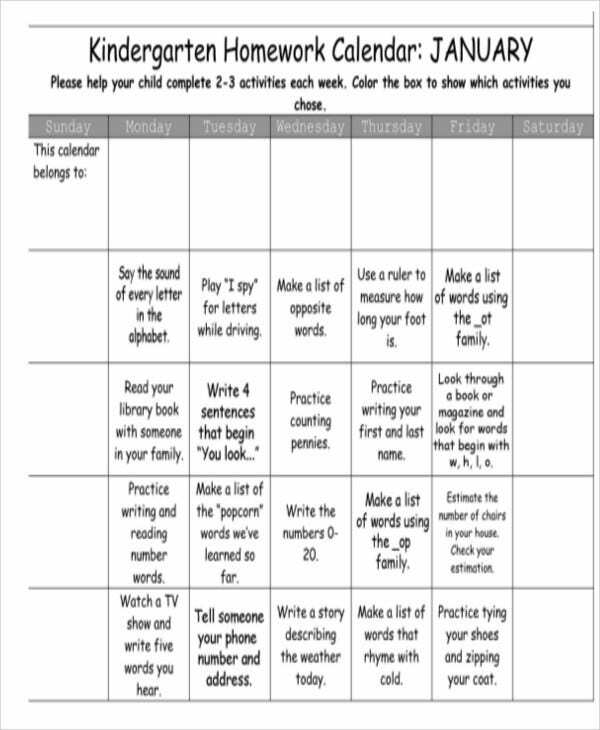 How to Write Homework Calendar for Preschool and Kindergarten? Identify the homework that needs to be accomplished by the preschool and kindergarten students. Make sure that the activities that they are tasked to create are appropriate for their age bracket. Together with the dates when you will give the assignments, specify the return dates when the assignments are should be accomplished. As much as possible, write down the description of the assignment and its relevance to the subject area that you are teaching. You can also identify how it can help the students in order for them to better understand their academic lessons. You can also use our templates designed so that all you have to do is alter the text. Or you can use them as guides when creating your own. Do this if you need to save time. If you want to have more references in creating other kinds of calendars, kindly browse through our downloadable samples of Countdown Calendar Templates, Social Media Calendar Template and Monthly Calendar templates. 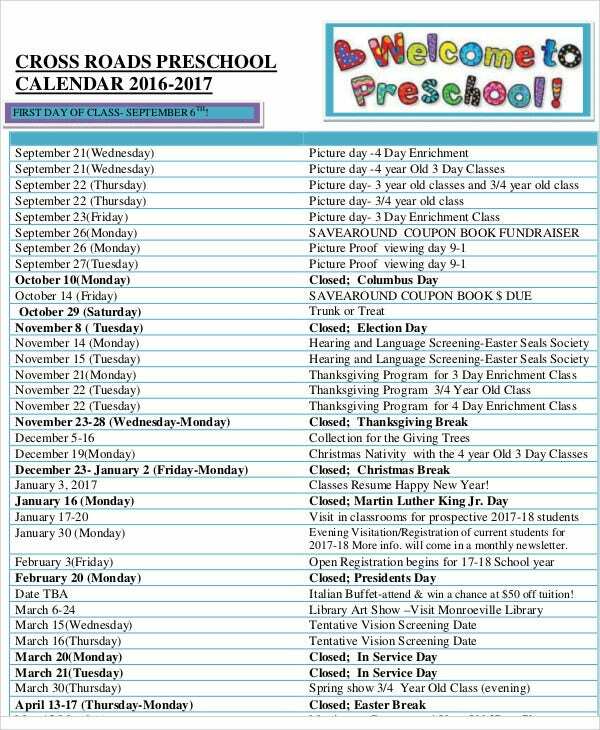 What are the Objectives in Writing a Preschool Calendar? 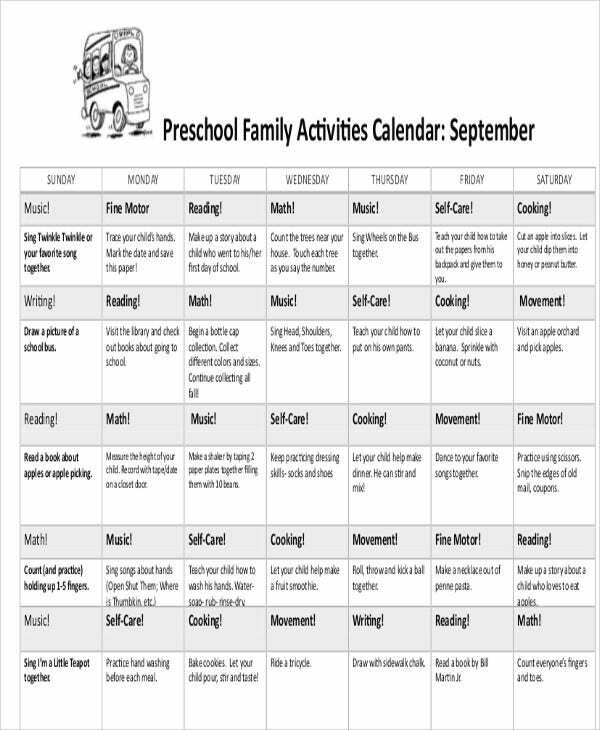 If a preschool calendar is created by a preschool teacher, it is to guide both the students and their parents about the things that are needed to be done within the classroom and in the premises of the student’s home to develop the academic learning of the student. 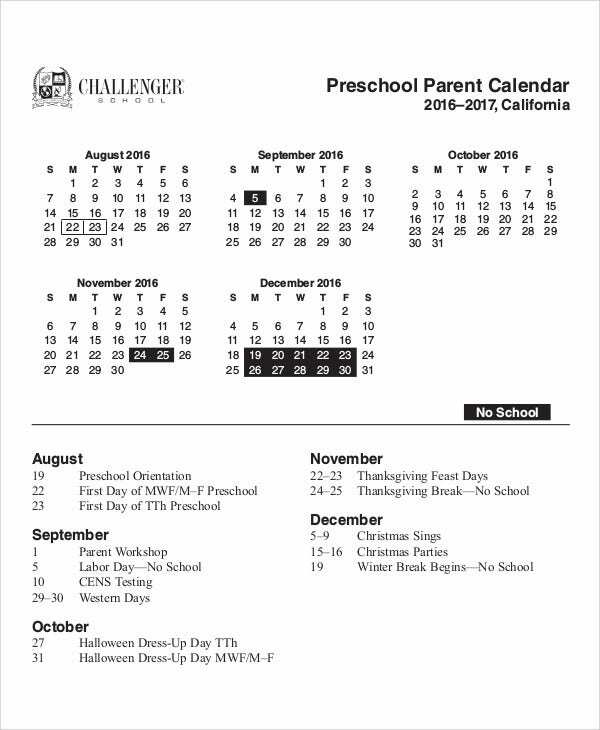 If a preschool calendar is given by the academic institution where the preschooler is enrolled, it is most likely a calendar of the enrollment dates and the activities where students are either expected or requested to participate. 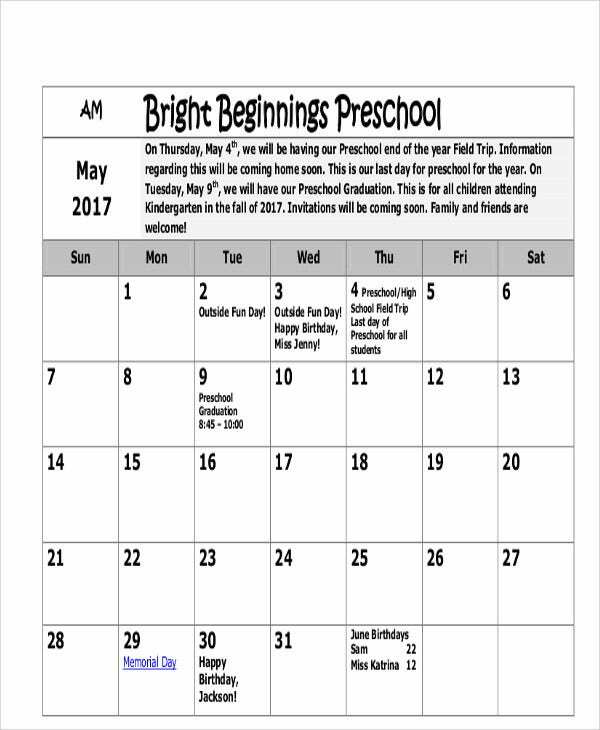 If a preschool calendar is made by a parent, the main objective of creating the preschool calendar is to help the student with his / her academic endeavors. More so, it can also help the parent to remember all the important items that are a part of the academic requirements of the preschooler. 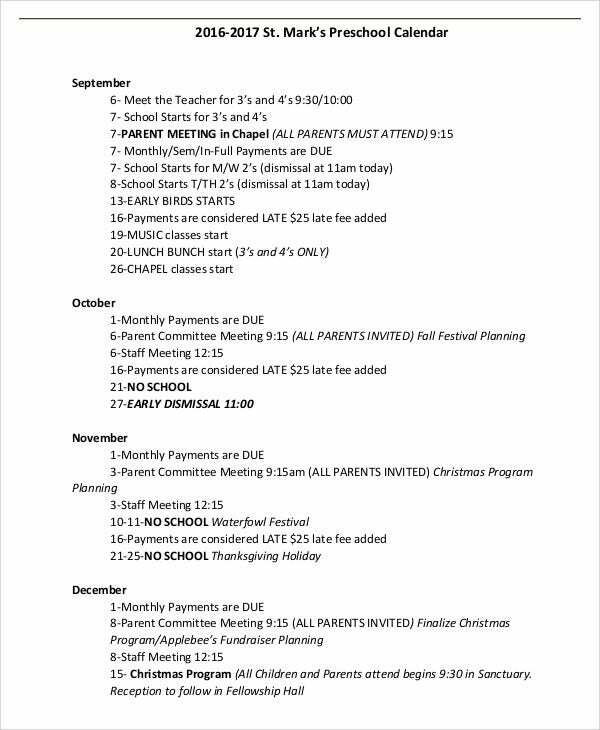 No matter what the objective of creating a preschool calendar is, it is very important to not just properly plan it but to also find ways on how it can be fully implemented for a long period of time. Other than our preschool calendar templates and samples, our Office Calendar Template and Perpetual Calendar Templates are also available for download in the respective links provided.